I was feeling a little grungy, so I decided to channel my favorite girl of the 90's. 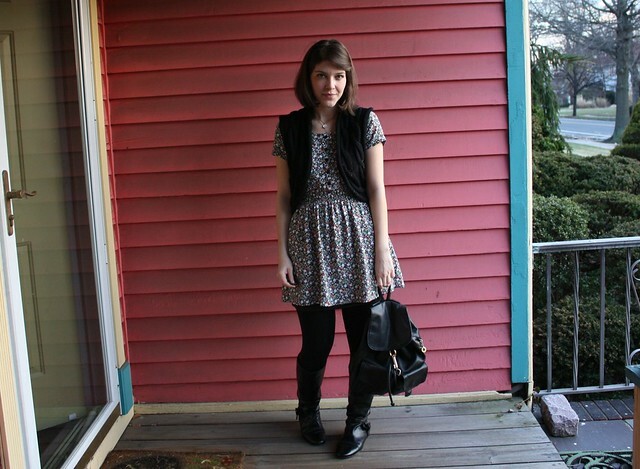 This was put together with Angela Chase in mind from my soundtrack (Sonic Youth, Cranberries, Violent Femmes) to the floral dress, vest, and leather backpack. Even though the series was created for teenagers, I originally watched it after I was in my 20's. Watching it put me right back into my high school self. I guess its true that not much changes about growing up no matter what generation. Angela: What’s amazing is when you can feel your life going somewhere. Your life just figured out how to get good. Like, that second. I love your dress and bag! You definitely wear this look well. Now I suddenly have an urge to watch the show myself! Adorable. I like when we find inspiration in art. I actually have the dvd's thats how much I loved My So-Called Life. My high school (small school) always complained and still cannot believe how such a show ever got cancelled. Most people have realized it wasn't the show itself, but that it aired at a time where too many other popular shows were airing, so it never got a chance. After it was cancelled, MTv realized the viewing increased and thats why it was played over and over. And why am I typing all this who knows? LOL LOVE THE OUTFIT! I so miss that show! What a super-cute outfit! I have that same vest in cream! Love your blog - NEW FOLLOWER! There certainly seems to be a lot of 90s nostalgia about at the moment. It makes me feel nostalgic too, even though I hardly remember it as such... (and the late 90s was awwwwful). i love my so-called life!!! You got me nostalgic:) But i do love your outfit, vey cute! you look great! you always have a very romantic style, and I love it!! I love that dress! Want to watch MSCL again NOW!! I love the Cranberries. My second favorite band ever. You look beautiful in this. Totally makes me think of the mid-nineties. pretty dress - love the boots! I loved "My So Called Life." Love your outfit. The print on the dress is adorable. You are channeling the 90's very well. Lovee this 90's look :D i love the Cranberries too, you've put me in the mood to go listen to them now! This is such a cute outfit and love your hair! Very cute outfit! I love your bag! wow a tv show i haven't heard of - i'm going to look it up in the hope that its like saved by the bell! Love the whole outfit! 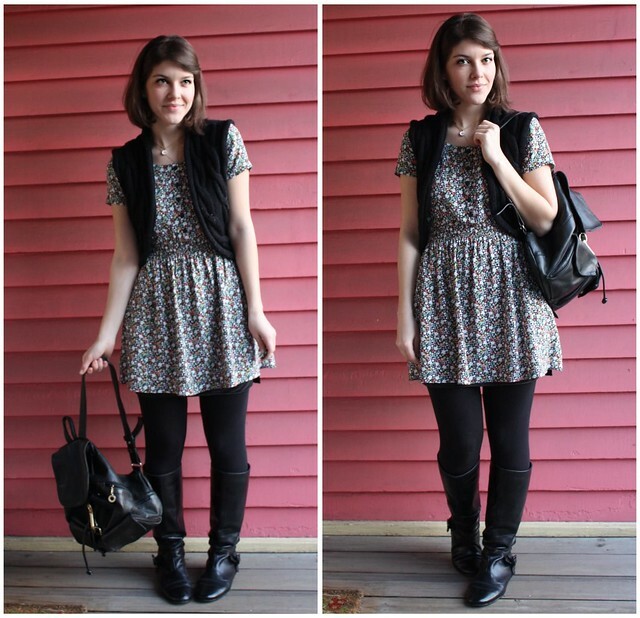 The vest is so cute and the vintage bag! oo I want! 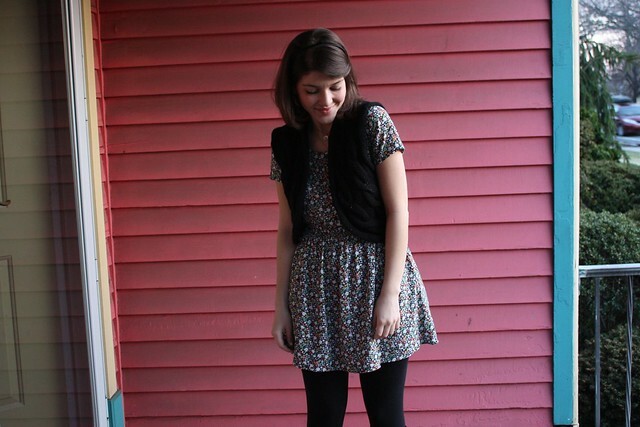 I love Angela Chase, and this outfit! aw, this is so cute!!!! i def see angela chase and claire danes in this outfit! i love the dress! cute dress! love it with the boots and vest. i loved my so-called life. i watched it in my 20s too, and really enjoyed it! Thank u for your lovely comment in my blog! very nice dress! I like your style! I follow you! Do you want follow me too? you do look very 90's, in a very good way :) I love your dress. i've never really been into the grunge look myself, but you look very nice here. i've been on a hunt for a dress just like this to wear with a fringed leather vest i found while thrifting. i'll have to stop by h&m sometime soon, this is very close to what i am looking for! I love this outfit! I keep almost buying that dress. You may have just convinced me I need it. also the fact that Jared Leto aka Jordan Catalano grew up to be such a hollywood weirdo is never lost upon me, but gosh he's such a dream boat in that series! Na-na-na-nineties! Now I feel the need to Spice Up My Life. Really, though, I love this look. I've been really vibing on the 90s as of late. Ha, now this is weird. I just re-watched all 19 episodes between last weekend & this weekend. It's magnificent, and you did a great job embodying the look. absolutely in love with your backpack! its gorgeous with the rest of your outfit!! I LOVE IT! i am all about 90's grunge. That dress is darling. And....no big deal....you have my dream backpack. I adore your hair here. the bangs are clipped up in such a cute and classic way!